Looking for delicious dinner ideas? 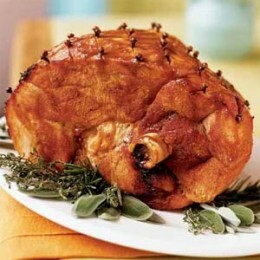 A nice baked ham can be a great dinner for your family and friends. 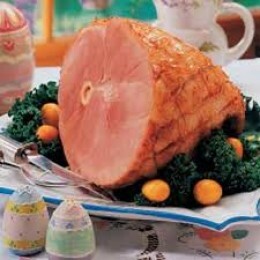 Here are two different recipes for glazed ham, both of them are absolutely delicious! If you are like me and have a small family you could take one ham and cut it into halves and then try both of these great and tasty recipes at once. Line a roasting pan with foil and place the ham with the cut side down onto the pan. Score the outside of the ham with a sharp knife and place the whole cloves down into the scored areas. Combine the honey, corn syrup, butter and pepper and heat the mixture until the butter melts. The mixture should have a smooth texture, stir constantly while heating to prevent sticking and scorching. The honey glaze can be heated in a double boiler and be left on low heat to keep the mixture warm while the ham is baking. Brush the entire ham with the honey mixture and cover with aluminum foil. Bake from 1 to 1 1/2 hours, basting the ham with the honey glaze every 15 minutes. The foil can be removed for the last 5 minutes of baking time to caramelize the glaze. Carefully cut the skin off of the ham and score it with a sharp knife. Place whole cloves inside the scored areas and put the ham in a roasting pan that has a rack to bake. Bake uncovered for 1 hour. Combine 1/4 cup of the brown sugar, honey, vinegar, cranberry juice cocktail, butter and flour in a small pan and bring to a boil. Cook the mixture for 1 minute. Coat the ham with the remaining 1 cup of brown sugar. Pour some of the hot cranberry glaze over the ham and bake for 30 more minutes, or until a meat thermometer reaches 140 degrees. Use the remaining cranberry glaze to baste the ham several more times during baking.